We are writing this letter after returning from a five-day meditation and yoga retreat at the Southern Dharma Retreat Center. We hope that you will make some time for reflection and rejuvenation, too, even if only for 15 minutes of contemplation. Our experience is that creativity and abundance spring from this place of quiet. Pausing from our very active lives this time of year is especially in harmony with the earth’s stillness now. Nature slows down. The leafless trees are steady. Animals are hibernating. Insects and plants are dormant. It is a time for rest and renewal for us all. And, we wish you a peaceful, healthy and fulfilling New Year in 2008. Although Lenore is on a semi-sabbatical until fall, there are several cooking classes scheduled per student requests. There are more people interested in the March Vegan Cooking Series than spaces available, so register soon by sending in the class fee. 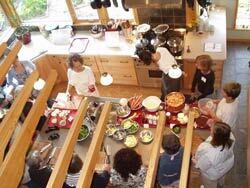 All classes include a complete organic meal, printed recipes, lots of cook’s tips and cutting practice. Learn how to make quick seitan and many ways to use this high-protein “wheat meat". We’ll cook it in a satisfying English Stratford Stew. Learn the fundamental principles of eating for optimal health. These four classes include step-by-step instruction, cutting techniques, countless cook's tips, easy-to-follow recipes and guidelines for dining out. We will prepare low-fat, satisfying meals that include soups, grains, vegetables, "gas-free" beans, pickles and desserts. Classes are on Saturdays from 10 am-1 pm with cutting practice at 9:30 am. For other class and registration information, please visit our Cooking Classes section at the website. Mark your calendars for the March 8th, Organic Growers School in Flat Rock, NC. It is always an enlightening day and an inspirational start to spring. Visit their website for details: www.organicgrowersschool.org. In December, Joe’s son graduated from ITT with a degree in computer networking. Way to go, Andy! This has been a passion of his for a long time. He has built and serviced computers for a while as a hobby and has been employed in industrial IT jobs. He has formed a company with a friend called Wild Goldfish, LLC - We make your computer problems swim away! They offer fast, affordable computer support to homes, home offices and small home-based businesses in the Detroit metropolitan area. If you are in need of any help with computing, call Andy at (248) 229-8767 and visit his website www.wildgoldfishllc.com. Jumping on a mini trampoline is not just an excellent cardiovascular exercise, it’s fun, too. It is also joint-friendly and improves lymphatic circulation better than anything else that you can do. We spend 3-13 minutes every morning jumping on the ReboundAIR™ and love it! After much research, we discovered that the ReboundAir is the best quality trampoline with a lifetime warranty (www.reboundair.com). It’s well worth the small investment for your health. I have the Half-Fold ReboundAIR™; it comes with a great video and carrying case. What is your biological age? How fast are you aging? Use the biological age calculator found at www.growyouthful.com/quiz.php. In our experience with doctors, even alternative doctors, they often miss looking at digestive health. When you think about it, though, all food nutrients enter the body through the digestive system. Mariani gives excellent advice on how to shift your health to a whole other level. Lots of practical guidance and a point-by-point program for rejuvenation, beginning with the colon! Another well-researched book on sleep problems with excellent advice that actually works! May there be peace within you today. May you trust that you are exactly where you are meant to be. May you not forget the infinite possibilities that are born of faith. May you use Gods gifts that you have received, and pass on the love that has been given to you. May you be content knowing you are a child of the universe. Let this energy settle into your being and allow your soul the freedom to sing, dance, celebrate, create and love. It is there, within, for each and every one of us.